I am Anine Cockwell De Jong, originally from The Netherlands but now living and working on the edge of the fens near Cambridge, England. The inspiration for most of my work is animals and the natural world. 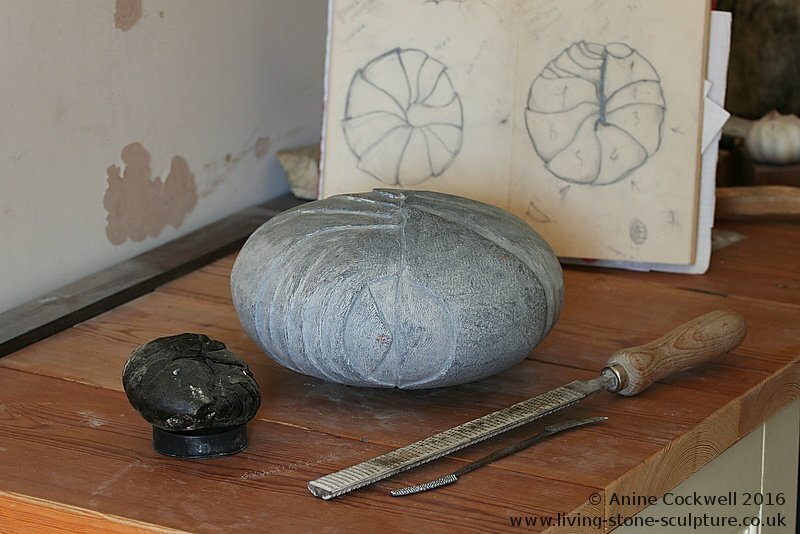 I hope you will enjoy this introduction to my art, and that it will give you the same feelings of wonder at the beauty and variety of nature which led me to begin carving. 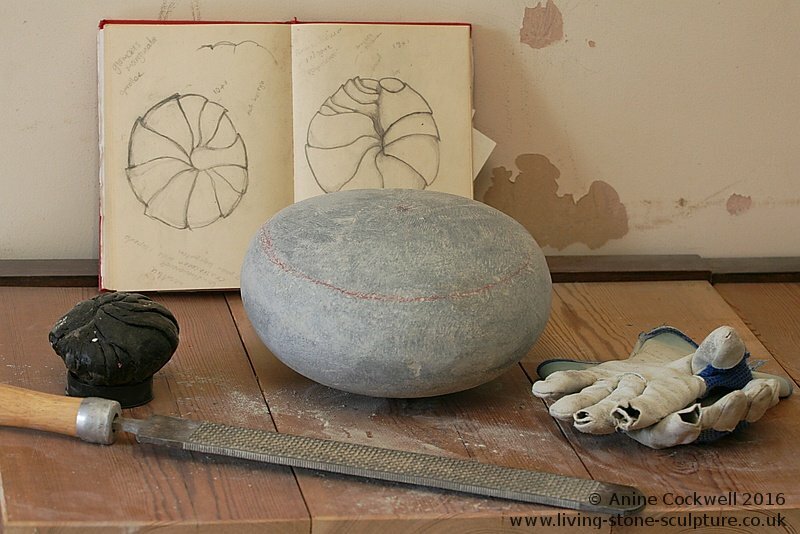 If you would like to try stone carving yourself then why not join an evening class at my studio in Over or take an adult learning course on Saturdays at Swavesey Village College? If you enjoy my work then please spread the word. If you would like to exhibit or buy any of my work, or discuss commissioning something unique, please contact me. I was born in Eefde, a small town in The Netherlands. 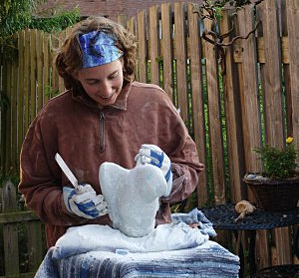 My childhood passion for nature was developed while studying Animal Management at Leeuwarden University. 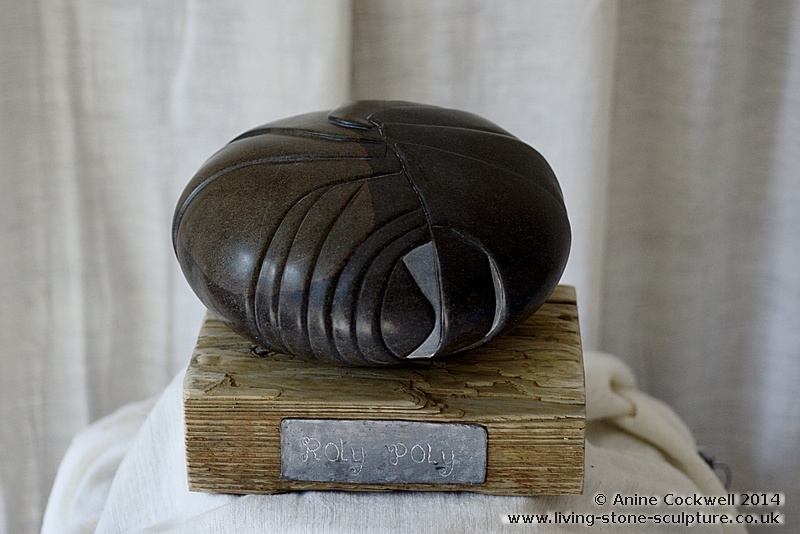 The inspiration for most of my sculptures comes from a deep and profound understanding of animals, developed over years of study and practical field work. 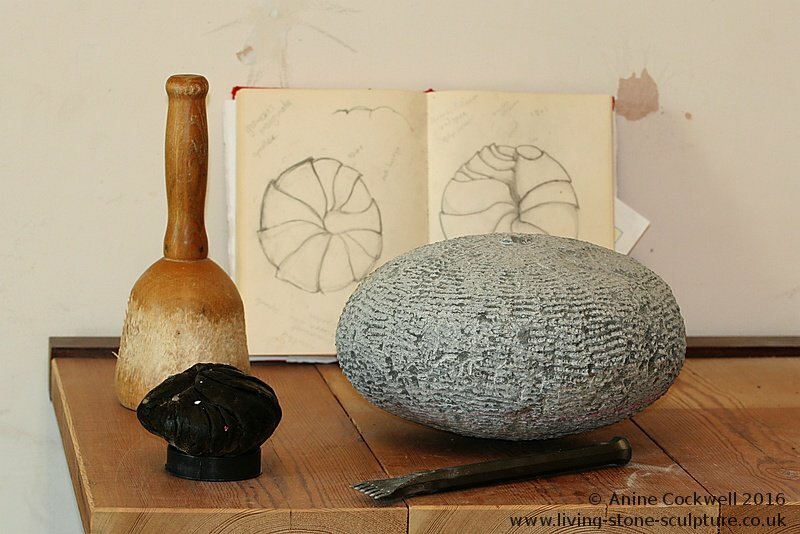 My carved animals are not simple facsimilies of the original form - I try to capture a depth of feeling, emotion, and movement that makes them 'Living Stones'. Following 5 years working on the island of Texel in the Environmental Education department of 'EcoMare', the Centre for the Wadden and North Seas, I am now based in Cambridgeshire, UK. Nonetheless, the sea remains a great influence on my work. If you are interested in commisioning, purchasing or exhibiting my work then please contact me. 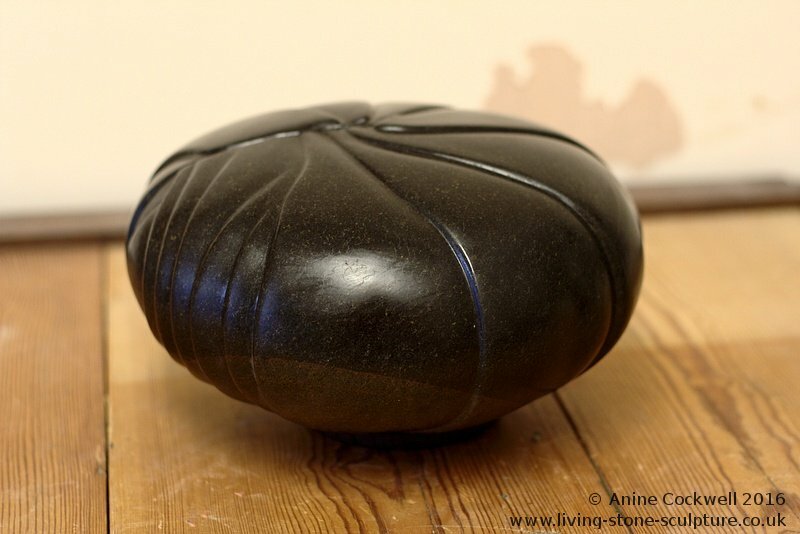 A selection of my work is often at Wood End Gallery in Bedfordshire. I participated in the wonderful Art4Africa exhibition at The Old Chapel House, Keysoe, from 6th to 9th September 2018. 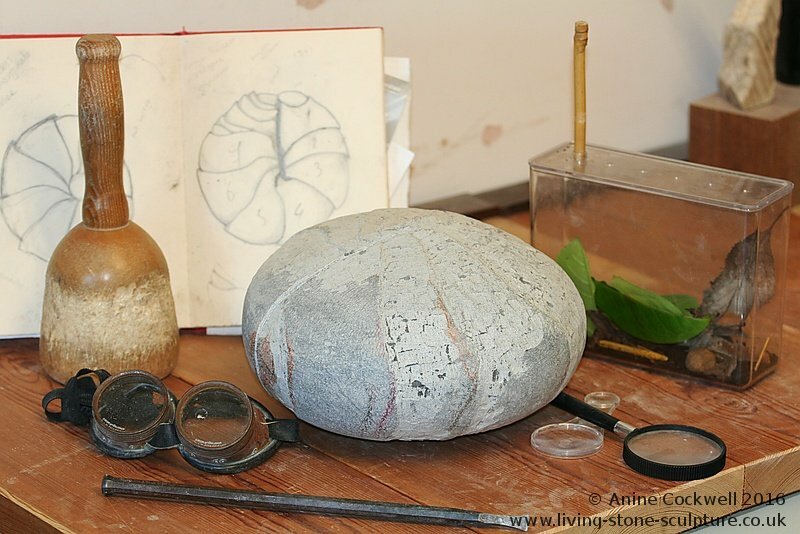 Some of my Living Stones have been featured in "The Natural Eye", the Society of Wildlife Artists' Annual Exhibition at the Mall Galleries in London. These include the Inquisitive Pangolin, my Sea Urchin and my larger than life woodlouse, Roly Poly. My work was also shown at the 2014 Rheebridge Open Art Exhibition in Cambridgeshire. In 2011 and 2014 I exhibited work at the UK's National Exhibition of Wildlife Art, NEWA. In December 2010 my work featured in 'The Variety of Life' exhbition at 'Nature In Art' in Twigworth, Gloucestershire, UK. I have previously exhibited at several galleries in The Netherlands. 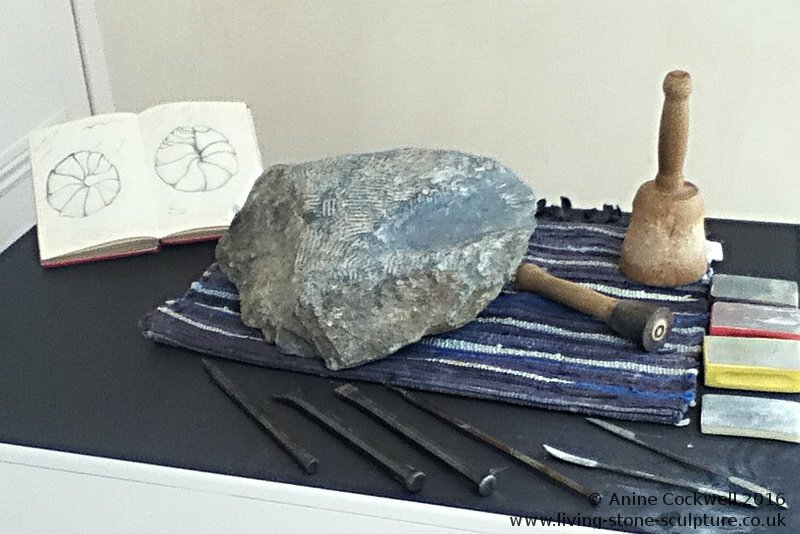 Every Living Stone is carefully hand crafted, following the story outlined in the rock. I rarely use power tools, preferring to feel my way into the rock. Click on the picture to see the making of Roly Poly: a 'larger than life' portrait of the often disregarded or mistreated woodlouse. 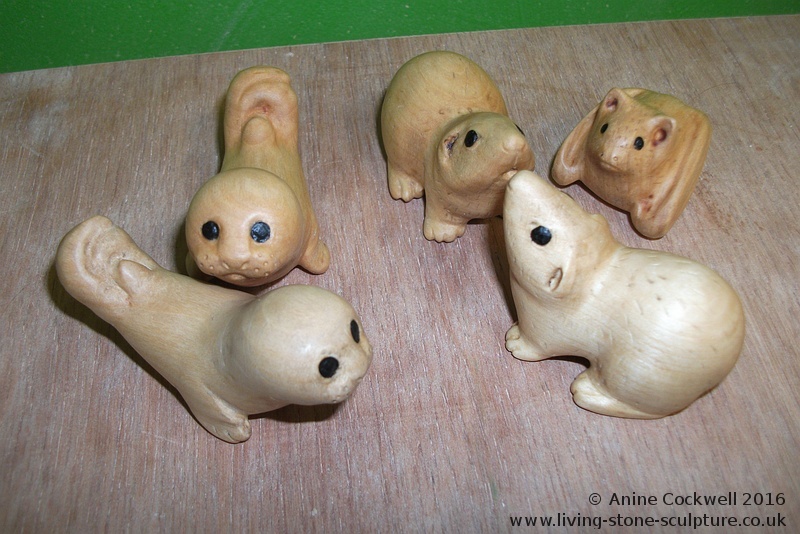 Netsuke (pronounced 'nets-keh') are beautiful carved toggles that originate in 17th century Japan. 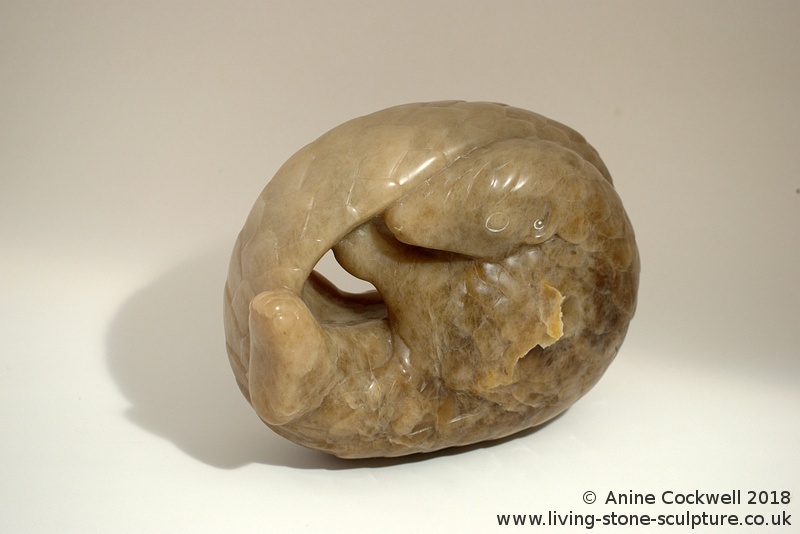 There are several types of Netsuke. Mine are 'katabori'. 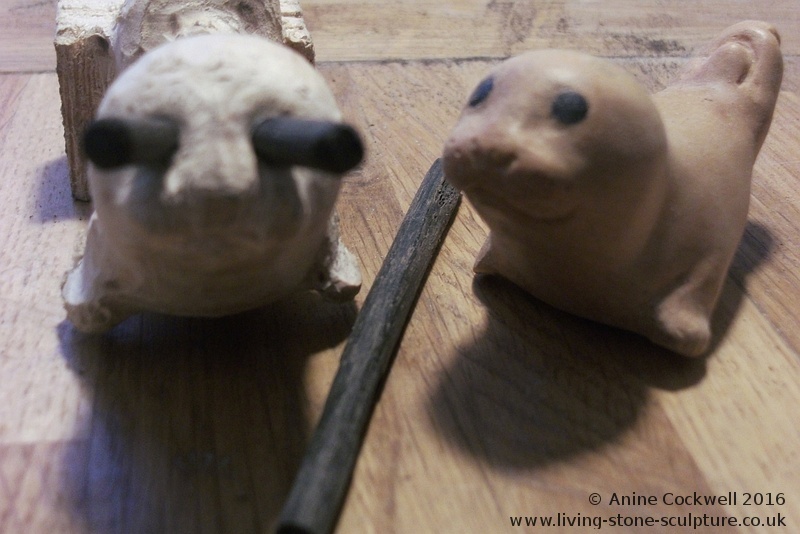 My preferred material for making Netsuke is wood as it is warm and natural. 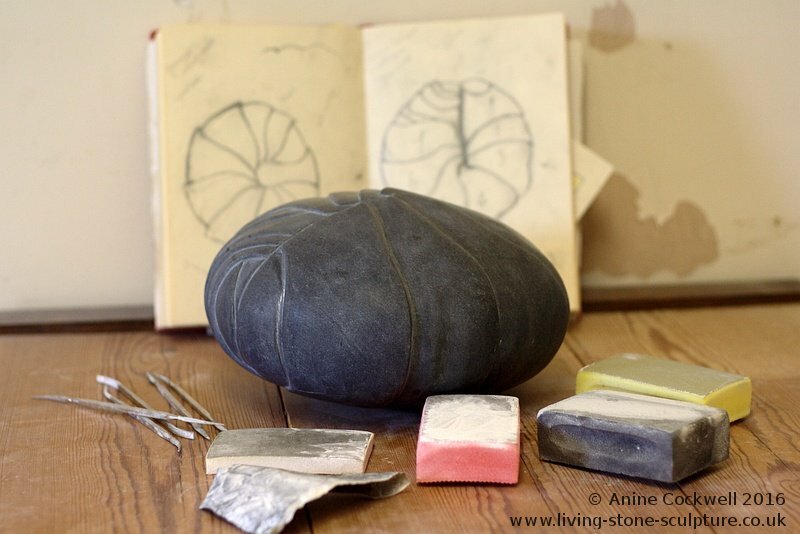 Combine that with the rounded shape and they are perfect for cradling in your hands. 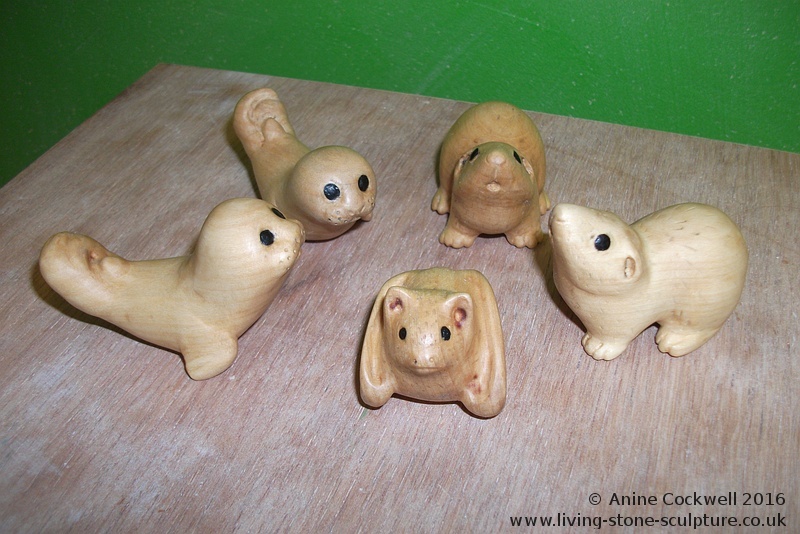 All my Netsuke are hand made and designed by me. They look through ancient eyes made from bog-oak dug up from our local fens. I make only 6 individuals of each design in any one type of wood. They are serial numbered in Braille. Six is both the first perfect number, a Chinese lucky number, and the number for love so it seemed the ideal number for these wee beasties. 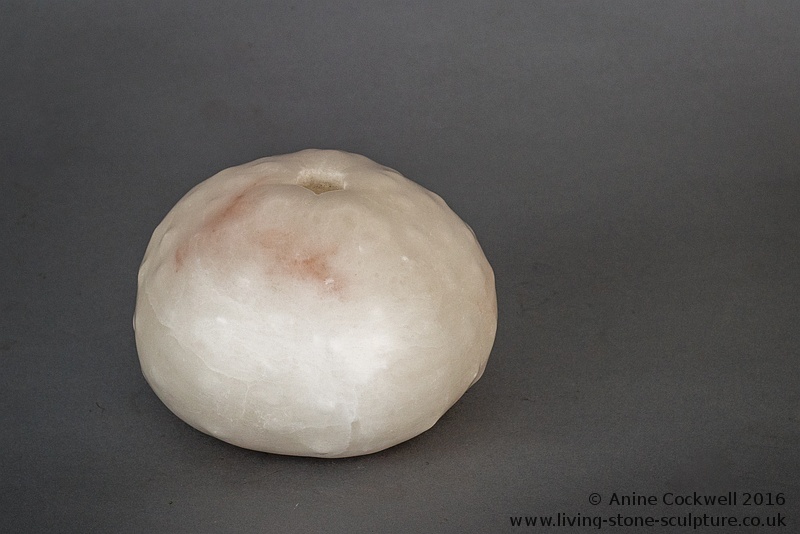 Take a closer look at my designs in the Netsuke Gallery or find out more about Japanese Netsuke here. 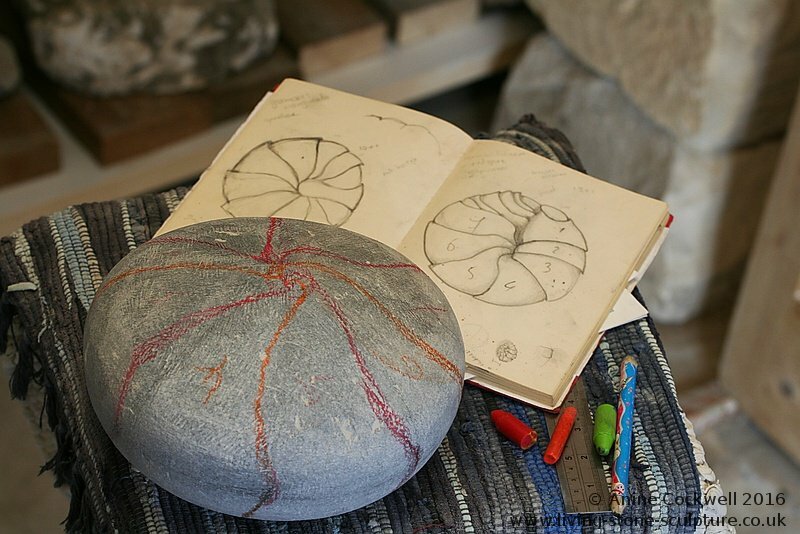 The Oloid is a fascinating shape, both mathematically and physically. It was discovered by the Swiss mathematician Paul Schatz in 1929 and is used industrially for aeration and agitation. My Oloids are for the opposite purpose. Shaped to nestle into the palms of your hands they are perfect for stress relief and have been purchased by musicians, physiotherapists and arthritis sufferers to help keep their hands supple. 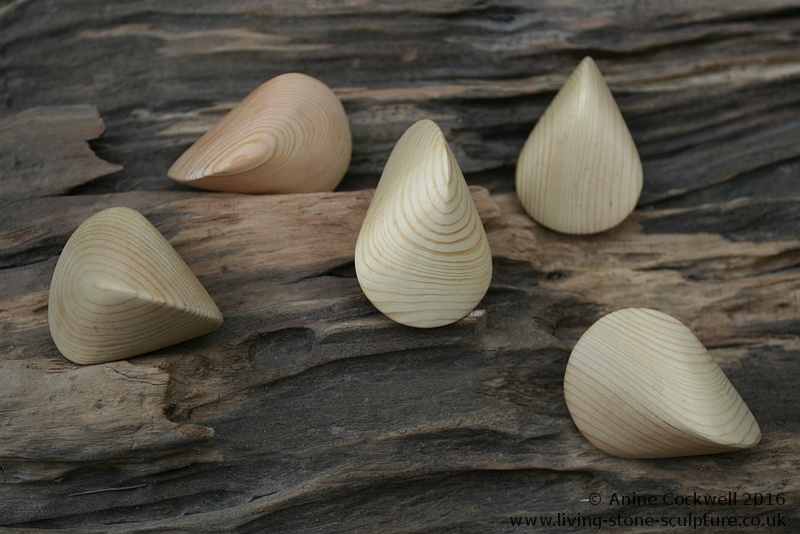 I began making them as an exercise in carving technique but found they were such a lovely shape and attracted such interest that I continue to make them when I have time, mainly using softwood but more recently also experimenting with various hardwoods. 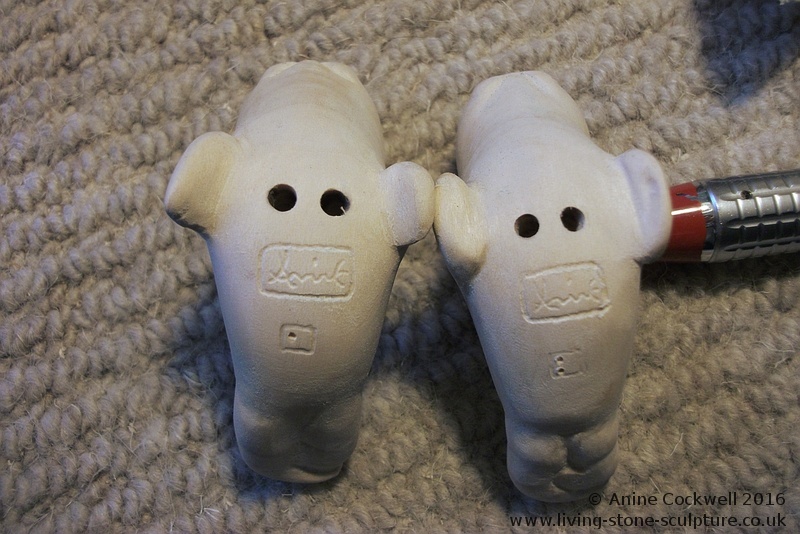 Take a look at them in my Wood and Mixed Media Gallery. For more information about Oloids try Wikipedia or Wolfram Mathworld. 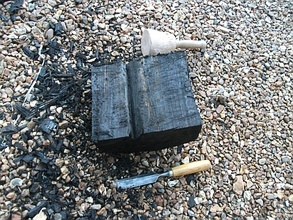 The bog oak I have used to create the pieces featured in my Bog Oak Gallery came from Ouse Fen in Cambridgeshire, a by-product of the sand and gravel extraction in Needingworth Quarry. 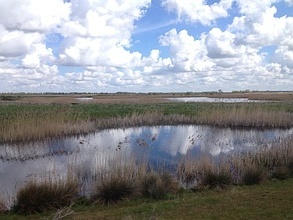 The gravel diggings are gradually being turned into a wetland nature reserve by the RSPB. Perhaps five thousand years after it was buried, the semi-fossilised wood was dug up, salvaged, then carefully cut into small pieces and dried (very slowly) over a further four years. 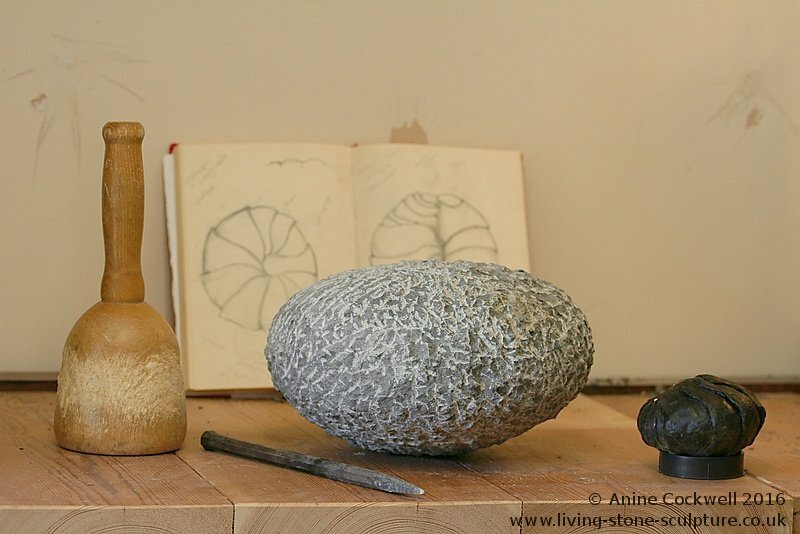 From this unexpectedly revealed treasure I am carving a series of my favourite fenland creatures. The seal that sits at the top of this page was made for touching, for looking with your hands as well as with your eyes. 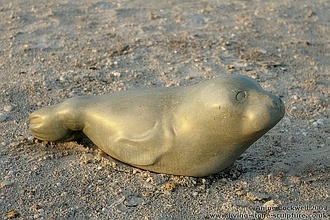 Before finding a permanent home the seal took a tour through The Netherlands. She stayed in hospices and clinics, on show and accessible to residents and patients. This included a year at 'Villa Pardoes' in Kaatsheuvel providing companionship and comfort at this holiday home for terminally ill children and their families. I often have pieces at Wood End Gallery, in Bedfordshire. I am a member of local artists' group Cambridge Open Studios.